Our pipeline system keeps products moving from points between Pt. Arthur, Texas to Hammond, Indiana. Each day, millions of miles of underground pipelines transport petroleum products across the United States to homes and businesses. Statistics show that pipelines are the safest mode of fuel transportation, both for the public and the environment, according to the National Transportation Safety Board. Technology plays an important role in keeping our pipeline running safely. From our operations control center in Tulsa, OK, we’re able to see what’s happening on our system and remotely control the flow of product. 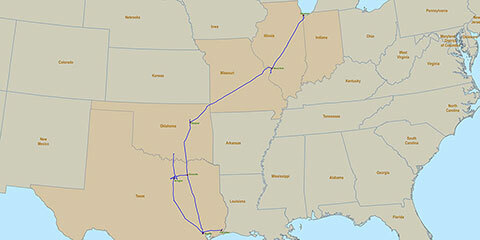 Explorer’s 1,830-mile system begins with a 28-inch line in Port Arthur to Tulsa, Oklahoma, and then changes to 24 inches into the Chicago suburb of Hammond. Capacity is augmented with a 10-inch line between Houston and Arlington, Texas. Major tankage and services to terminals are located in Port Arthur, Houston, Greenville, Arlington and Grapevine, Texas; Glenpool, Oklahoma; Wood River, Illinois; and Hammond, Indiana. 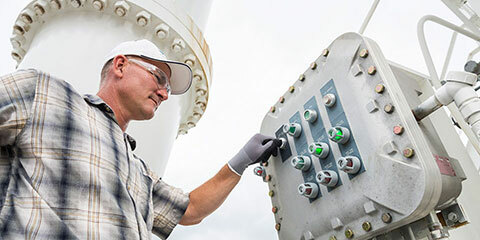 Thirty-seven pump stations along the pipeline keep our customers’ product moving. We transport refined products with more than 72 different specifications for more than 60 different shippers.